Home Comic Books The Original Sin of "I’m In Charge!" The Original Sin of "I’m In Charge!" Marvel’s new mini-series Original Sin focuses on who murdered the Watcher and why. After discovering the Watcher’s body on the Moon, Captain America asked Nick Fury to lead the criminal investigation into the Watcher’s death (Issue 1). Upon landing at a battle between the Thing and Spider-Man against one of the Mindless ones in New York, Nick Fury declared the area was a crime scene and that he was in charge. Id. Moreover, Fury and other super-heroes ultimately lead an assault on the Watcher’s suspected murders (Dr. Midus, Exterminatrix, and the Orb) in New York City, which ended with Nick Fury placing the Orb under arrest (Issues 2 and 3). There are multiple issues with these facts. 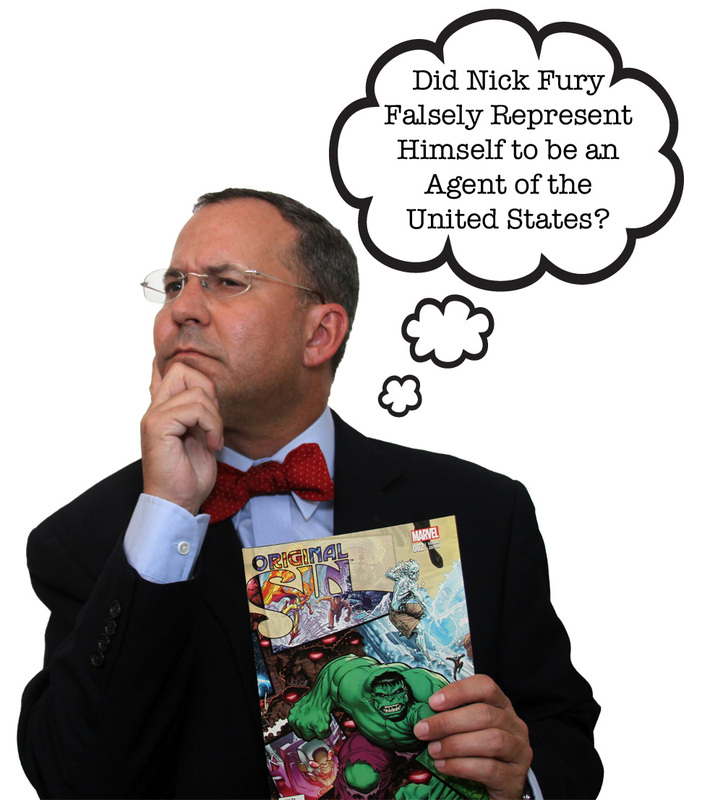 First, could Captain America deputize Nick Fury to lead a criminal investigation? 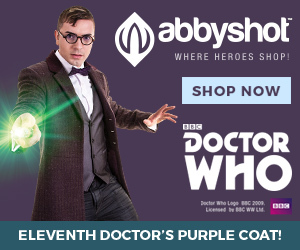 Second, could Nick Fury arrest the Orb? Three, could Nick Fury detain the Orb in the Avenger’s Tower? 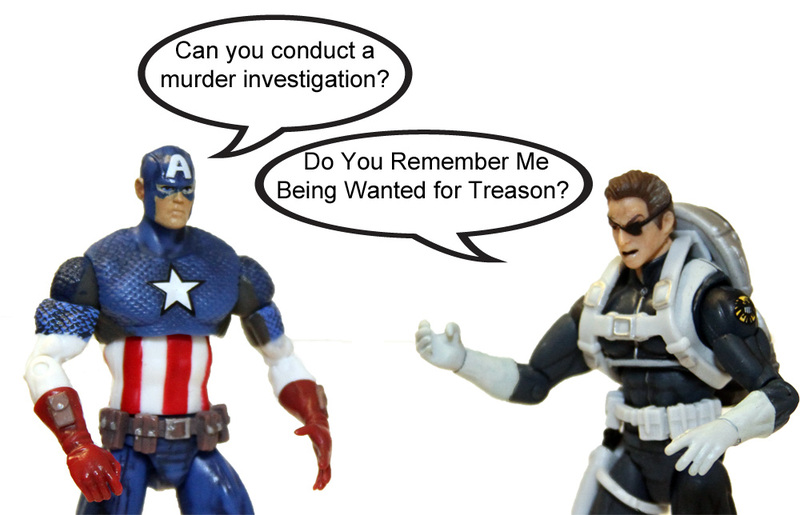 Captain America may have been legally in the right to appoint Nick Fury to conduct an investigation, much like a private individual can hire a private eye. However, that appointment does not necessary give Fury legal authority to execute law enforcement actions, unless Captain America were acting on behalf of the United States with the powers to deputize others to conduct law enforcement activities. If Captain America did not have such authority, both New York and Federal law would prohibit Nick Fury from representing he was “in charge” and arresting the Orb. Federal law states that “Whoever falsely represents himself to be an officer, agent, or employee of the United States, and in such assumed character arrests or detains any person or in any manner searches the person, buildings, or other property of any person, shall be fined under this title or imprisoned not more than three years, or both.” 18 USCS § 913. In New York state, a person is guilty of criminal impersonation when they pretend “to be a public servant, or wears or displays without authority any uniform, badge, insignia or facsimile thereof by which such public servant is lawfully distinguished, or falsely expresses by his words or actions that he is a public servant or is acting with approval or authority of a public agency or department; and (b) so acts with intent to induce another to submit to such pretended official authority, to solicit funds or to otherwise cause another to act in reliance upon that pretense.” This is a class A misdemeanor. NY CLS Penal § 190.25(3)(a) and (3)(b). Nick Fury’s arrest of the Orb would violate both Federal and New York law, because it is an act implying law enforcement powers, unless there was an off-camera scene with Fury being officially deputized by law enforcement, such as someone like the Governor of New York or the United States Attorney General. Moreover, Fury did not say he was placing the Orb under “citizen’s arrest,” but instead implied that he was a public servant who could conduct arrests. If Fury was acting under actual authority to conduct law enforcement, he did not give the Orb his Miranda rights. However, the impersonation did not end there, as we later learn that Fury was actually an LMD after the Winter Soldier killed him. Or it. Which raises a whole new level of impersonation, if not identity theft, if there were law over Life Model Decoys.